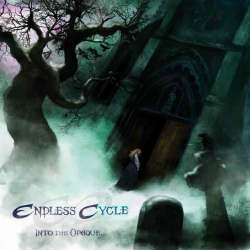 Endless Cycle is a Dutch progressive death metal band which was founded six years ago in Terneuzen, a really ugly town from an otherwise quite picturesque country. It’s probably a comfort that this bleak place has birthed one of the hottest metal bands in the Netherlands. At first the five musicians took things slowly. A first, short demo came out in 2007, but then it took them four more years before their self-released debut longplayer saw the light of day. One of their older tracks, Blueprint (Aquaphobia), is in my opinion still the band’s strongest piece. But the newer material doesn’t need to hide behind it, as the mostly long tracks (between five and eleven minutes) are full of ideas. It is actually not easy to strictly determine their style, which in this case is a good sign. Extreme genres like thrash, death and black metal are all present, but you will also find some timeless rock and even Seventies rock influences. Endless Cycle take the liberty of stringing together all of these different elements rather arbitrarily, resulting in something entirely unpredictable and definitely not easily comprehensible. But that’s exactly where the fun lies. They are not restricted by rules and therefore are able to surprise their audience time and again. At times they are acting as harshly as the early Celtic Frost, just to be followed by quieter atmospheric parts that draw parallels to Anathema and My Dying Bride. The Seventies component also leaves a strong impact with its psychedelic elements. From a technical point of view, the band is also beyond a reproach, and it is amazing to follow their skilful instrumentation and songwriting. Another highlight is the extremely varied vocalist who doesn’t limit his repertoire to growls and clean singing, but also offers moody multilayered parts and even spooky touches. I could go on reciting all their virtues, but maybe it’s better you just listen to them by yourselves. If you are looking for something completely different in the metal genre, there is no way past Into The Opaque.